One of our clients, survivor Hymie Steinmetz, spoke at the New School in NYC at a seminar given on holocaust literature . The professor, Shamar Hill, is a volunteer of our Connect2 visiting program as well. To bring in the Purim spirit we hosted a intimate lunch and group session for some of our holocaust survivors. After a very tasty lunch from the Surf Solomon senior center, our intern,Talia Fischer , provided a seminar on Purim. At the seminar Talia re-told the story of Purim and our survivors added their reminisced about how they spent Purim in Europe before the war. Yiddish "Purim Shpeil " were performed and songs were sung by the group, and a great time was had by all. Sheepshead Bay and the surrounding areas are home to one of the largest communities of Holocaust survivors in the world, but the numbers of those who remain are thinning. 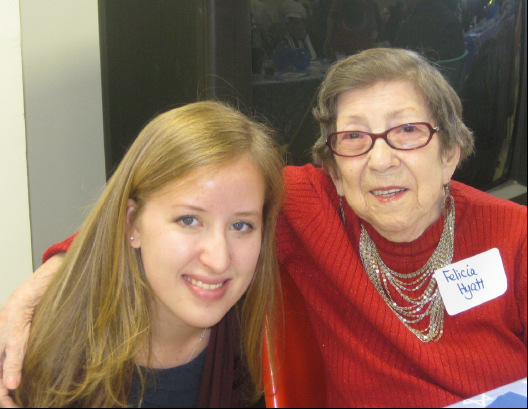 Which is just one reason why you should consider Jewish Community Council of Greater Coney Island’s (JCCGCI’s) “Connect2- program, where you’ll be able to help someone live better, while becoming a historical diplomat to better carry the lessons of the Holocaust for another generation. At age twenty-four, Daniel Brody certainlyhad enough responsibilities to keephimself busy. A member of the UpperWest Side Orthodox Jewish community,he had recently graduated law school andstarted working as an attorney. Butdespite the demands of his career, Danielfelt a strong urge to seek out a volunteeropportunity and help someone in need. A project of the Jewish Community Council of Greater Coney Island and Shorefront Jewish Community Council.